- Public Medical Assistance increased significantly from an approved budget of approximately $800,000 in 2018/2019 to well over $5 million! 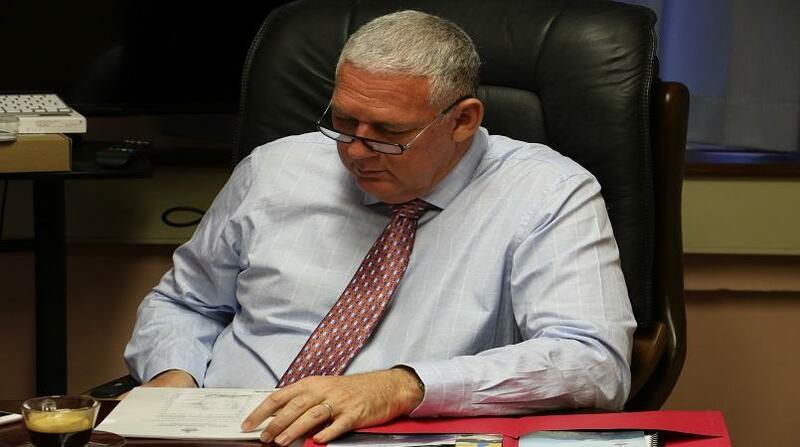 - A sum of $325.3 million has been allocated to meet debt service requirement during the financial year 2019/20. This amount comprises of interest payments of $182.3 million and principal repayment of $142.96 million, $12 million of which is expected to go towards building up the sinking fund to liquidate maturing debt instruments. - With respect to transfer payments, the government is proposing to allocate a sum of $178.2 million representing a reduction of 1.6 percent or $3 million below the revised estimates for 2018/19. The reduction is primarily as a result of the reduced subvention to the St. Lucia Tourism Authority which was previously shown as a capital item but is now reclassified as recurrent expenditure. - The bulk of my government’s capital allocation is geared towards improvements in the agricultural production, infrastructural development, sports infrastructure, health and education. - Of the total capital budget, an amount of $79.8 million or 32.3 percent of the total development budget is proposed for allocation to the Department of Infrastructure, Ports and Energy, which will cater for ongoing roads, bridges and maintenance/rehabilitation projects. Mr. Speaker, the proposed allocation for roads and bridges for 2019/2020 represents the largest amount since the fiscal year 2006/07. - My government has also allocated $7.8 million in additional resources to continue ongoing projects under the Department of Agriculture, which includes the water supply redevelopment projects in Vieux Fort and Dennery. - A proposed sum of $20.6 million has also been allocated to the Department of Sports to cater for major improvements to sporting facilities around the island. -Though we continue to experience budget deficits, I am pleased to report that the budget out-turn for the fiscal year 2018/19 indicates a lower overall deficit of $68.43 million, compared to the estimated deficit of $163.92 million in the approved estimates for that year. This was due to the combined effect of higher than anticipated revenue earnings and some notable under-spending of the budget. -Total grant disbursement in the fiscal year 2019‐20 is estimated at $49.08 million which constitutes 3.9 of total resources. It is expected to cover 15.6 percent of the total capital expenditure. -Based on actual data for the 11 month period ending February 28th, 2019, total revenue and grants were projected to increase by $27.82 million above the approved estimates of $1.176 billion to reach a total of $1.204 billion for the fiscal year 2018-2019. This performance is largely influenced by higher than projected inflows from Import Duty, Service Charge, VAT, Income Tax Individuals and CIP receipts. Receipts from CIP donations registered the most significant improvement with a surplus of $37.3 million or 126 percent above the estimates for the fiscal year 2018-19. -Overall, receipts from taxes are estimated to register a 5.17 percent increase, equivalent to $54.12 million above the target for the fiscal year. The estimated out-turn for receipts from non-tax sources is $69.26 million representing an increase of 10.1 percent over the approved estimates. The improvement in revenue outcome for the non-tax category is largely the result of higher than anticipated receipts from motor vehicle and drivers licenses. 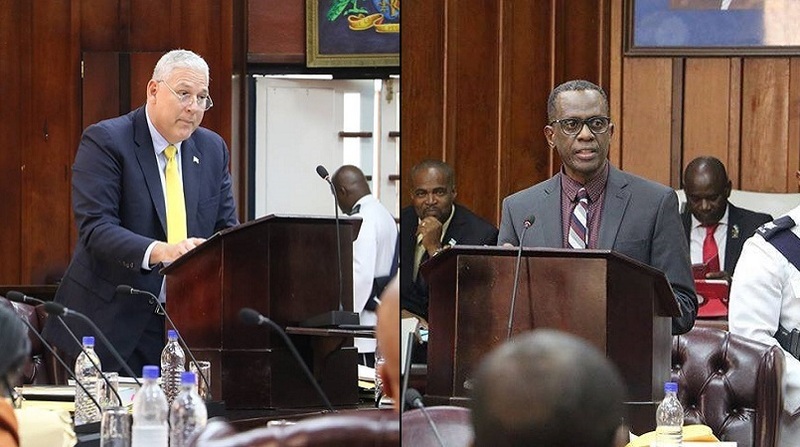 Mr. Speaker the tabling of these estimates must be viewed from its impact on the local populace: have the monies spent in the last fiscal year 2018/2019 improved the lives of most Saint Lucians and are there reasons to believe that the planned expenditure for the 2019/2020 are realistic and likely to improve the living conditions of Saint Lucians? Mr. Speaker, the management of the St Lucian economy must be done in an environment of fairness and inclusion, and with a level of fiscal responsibility so that our young people are not disproportionately burdened with the debts we are undertaking today. Mr. Speaker, our procurement rules are designed to meet the requirements of fairness and inclusion and moreover, that the Saint Lucian people get value-for-money from all government expenditure. But what has been the experience to date? We have been seeing an unprecedented number of government contracts awarded without contractors being invited to tender. The government in a show of contempt for good governance and accountability are awarding multi- million contracts to a select few: friends, family and foreigners. It is no wonder that the vast majority of Saint Lucians are worst off with a deteriorating health care system, which government ministers and their families avoid for overseas health care, relatively high fuel prices, a deteriorating school infrastructure and rising food prices at the supermarkets. That is the real story on the ground. This is particularly hard for Saint Lucians to stomach when large sums of government monies are being wasted on hair-brain projects like DSH, and on fines and penalties incurred by government on account of poor management. Mr Speaker this is the context in which I will examine these estimates and not with the jaundiced eyes of this government, which seek to distract and bluff the people of St Lucia believing it to be clever politics. Mr. Speaker it is not clever politics, it is disrespectful and harmful to the well-being of the people whom they were elected to serve. Mr Speaker, the effects of by-passing the tendering process are there to see. According to the estimates Page 523, $18m was spent by the Ministry of Economic Development in the last fiscal year on the George Odlum Stadium, of which $15M was on the building. As we speak, despite this massive expenditure, parts of the stadium have no roof with flies taking over the hospital facility making it uncomfortable for health workers to administer proper care to their patients. St. Jude Hospital. In spite of this massive expenditure, Health care at the facility has not improved, people continue to die because of a lack of adequate resources (Page 523). These monies that are being wasted still need to be funded either through borrowing or taxes. Well, they have targeted the minibus drivers to pay up more, never mind the high price of fuel created by the imposition of the $4 excise tax on every gallon of fuel. On page 66 of the estimates, route- permit fees are to increase by over 500% in the year 2019/2020. We await to see the effect on consumers of this increase on bus fares. Will the citizens of this country get a proper accounting for the $30M of Consultancy Services and Commissions that were paid in the last fiscal year? Were all the consultants chosen by tender? What did these consultants produce? And what efforts were made to utilize the capacity within the civil service to perform these consultancy tasks? Will the $47.4 million of capital expenditure allocated to the Ministry of Economic Development follow the customary path of direct awards to closely connected contractors to the government? These are the questions that need to be answered if we are to determine whether the plans for 2019/2020 are no different from last year’s preferential arrangements for granting contracts. Mr Speaker it is proposed that there will be $246.7M for capital expenditure in 2019/2020 but there is little hope for many contractors looking for work. So, Mr. Speaker you can understand with so much money to be spent on capital projects why so many contractors are unlikely to benefit because of a policy that should be the exception has become the norm: the awarding of direct awards. Another abuse of the rules, only because the procurement rules provided a small window for emergency situations, to allow for direct awards on the basis that Honourable members would be reasonable and responsible. I leave it to the public to decide on the character of those entrusted to run the affairs of this country. Mr Speaker, the people of Saint Lucia are convinced that the direct award of these major contracts are unfair and open to corruption, nepotism and wastage. Mr Speaker let me turn to an analysis of the Budget Summary as presented by the Prime Minister. The government will make much of an increase in overall revenue collected of $59 M over last year, a closer analysis of the figures indicates. The revenue increase was significant under the CIP programme. $66M collected this year as compared to the projected $29M – a difference of $37M. There was a significant increase of over $20.1M in current transfers. The Social and Economic Review indicates that this increase was due to “a payment to settle a legal matter with a CIP developer”. However the amount paid was not disclosed. In the interest of accountability the exact figure paid needs to be disclosed since the Prime Minister has accepted blame for the failure of that project. Once more I want to advise civil servants involved to always maintain your professionalism and resist the pressures from politicians to withhold important information, which should be in the public domain. Mr Speaker, I note the massive increase in capital expenditure for 2019-2020 of in excess of $100M over that projected for 2018/2019. The rate of project implementation in previous years is not encouraging. In 2017/2018 capital expenditure of $157M fell $19M short of the approved estimates for the same year ($176M). In 2018/2019 Capital expenditure of $143M will again fall short by $33M of the approved estimates for the same year ($176m). If the capacity was not there to realize smaller levels of capital expenditure in the previous two years, then we have no reason to believe that the government will be able to implement the capital expenditure projects it has planned for 2019/2020 totaling $246M. The poor level of implementation in previous years, coupled with no evidence of improved project implementation capacity make the 2019/2020 Capital budget unrealistic. No amount of sod-turnings events and project announcements will erase the image of a minister of finance carrying an empty basket promising food for the people. We have had too much evidence of a Prime Minister and Minister of Finance who promises much and delivers little. Public trust in this government has long gone and with justification. Mr Speaker, I have good reason to believe that the allocation of expenditure under some headings fails to tell the true picture of what some departments are costing the people of St Lucia. On page 137 of the estimates the High Commission in London has 5 persons approved yet there are at least 9 people working there. The increase in recurrent expenditure for the Ministry of External Affairs was over $1M more in 2018/2019. Yet it was this government when in opposition complained about the level of expenditure in foreign missions. There is need to uncover some government expenditure that appear to be buried in the estimates. I refer to the monies paid to attaches to the ministers. Under what caption in the estimates are they and how much? We note the increase in transfers of $18M and as I stated before no mention is made of the amount paid to Range for the ill-fated project which the Prime Minister has not explained to the people of St Lucia. Mr Speaker the National Trust is still being punished by withdrawal of its subvention. Mr Speaker, the government’s fiscal irresponsibility continues; all significant financial indicators are expected to decline this year. Signs are that the Minister of Finance is getting desperate to get the economy moving having wasted almost three years, disrupting projects he inherited from the last labour administration and seeking ways to reward friends, family and foreigners. So he has planned to plunge the country into a deficit position in the hope that he can revive the economy with the next elections on the horizon. For the year 2019/2020 surpluses have decreased and deficits increased leading to a projected overall deficit of $189M or 3.5% of GDP. Mr. Speaker this government is recklessly putting the country in debt by an overspend of nearly $200M. Within the context of what this government inherited when the primary balance was positive and the overall deficit was 1.9%, of GDP, it is now steering the economy in the wrong direction. All of this is symptomatic of an uncaring government that is misguided by selfish desires of winning elections. Mr Speaker I expect to hear in the policy statement by the Prime Minister the same promises of huge projects except that this time we may move a step further with the turning of sods proclaiming projects. The Social and Economic Review indicates on Page 47 “a higher current account surplus which is expected to increase to $76.7M in 2017/2018 to $97.9M in 2018/2019. 1) The budget summary does not seem to say the same story. The Budget Summary states that current account surplus is $30M and is projected to be $5M in the coming year. Mr Speaker, the increase in excise tax on fuel was proposed initially to be placed in a “lock-box” now the language has changed to “earmarked”. The increase in revenue was due to the relatively high taxes on fuel. Mr Speaker I want to ask the Prime Minister once again how much is in the “lock-box”. Mr Speaker, interest charges will increase this year due to the increase in borrowing by central government. Mr Speaker the government’s dismal performance in capital expenditure is the reason for the improvement in the deficit. If the approved capital expenditure for the year of $143M had been utilized then the situation would be different. Mr Speaker the government’s boast is actually a mirage since its capital spending contracted by 15.3% the lowest since 2008/2009 when the UWP were in power. The low growth rate of just over 1% can be attributed to the government’s poor performance in capital expenditure. This means that the economy is not growing, hence the relatively flat unemployment figures. The Budget Summary shows that the current account to be in deficit of $20M in 2017/2018. Mr Speaker the parliament of Saint Lucia approved the following for the year ended March, 2019. A total of $275.4 M EC without treasury bills. However the budget summary shows total of only $197M. We need an explanation for the difference. Mr Speaker the opposition needs to know why these debt approvals by parliament are more than the figure in estimates. Mr Speaker total national debt is $33Billion. We note an increase in the national debt of 4.1% when compared to the period 2017-2018 of 3.5%which was lower than the period 2009-2013. It is clear Mr Speaker that the UWP government record on debt is not what is espoused by the Prime Minister. 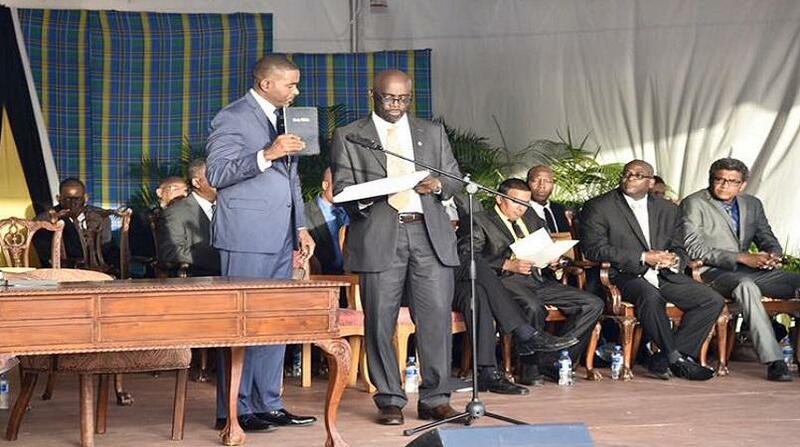 The UWP government has put the country into more debt. Government intends to borrow $332M this year without any mention of the guarantee of nearly ½ Billion for the airport. 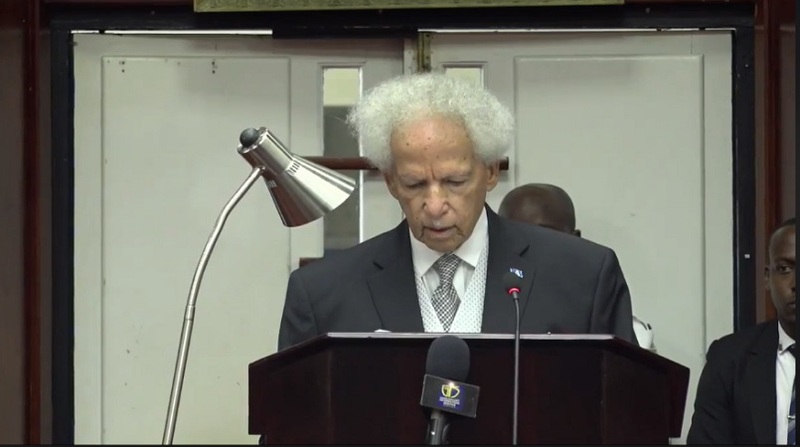 Mr Speaker the IMF report for Saint Lucia flags the rising public debt and projects an increase to 81.3% in 2023 even after the government had the benefit of a 19% increase in nominal GDP that reduced the public debt. The Social and Economic Review (Page 8) states that initial estimates of growth rate in 2018/2019 was only 1.5% as compared to 2016/2017 in which the growth rate was 3.3%. It is a fair to say that the policies of the Labour Government had more to do with the growth rates of 3.3% in 2016/2017 and that the growth rates of 2018/2019 1.5% can be attributable to the UWP administration policies having been in office for a full year. It is significant that there was a 20.2% decline in construction activity in 2018 which clearly shows that there have been little construction projects initiated by this government in 2018 and private sector confidence appear to be weak with very little construction. The policy of direct awards and its limited reach also accounts for the decline in the sector. The increase in revenue does not manifest itself in the overall performance of the economy. Growth was flat, just over 1%. The projected growth in the year 2019/2020 is based on an increase in borrowing and unrealistic expansion in capital expenditure. Mr Speaker, if ever there was a case of the numbers not telling the story on the ground, these estimates are it: they do not tell of the hardship the majority of Saint Lucians have been experiencing. And there are good reasons why the estimates don’t add up, whatever new money the government has spent, it is for the benefit of a handful of people, the FFF group. So what are the details beneath those numbers in the estimates? And why are so many citizens not able to experience whatever little growth may be there. Mr Speaker, the answer for the exclusion of so many Saint Lucians from whatever benefits the economy may have experienced in the aggregate is on account of hurtful economic policies adopted by this government that favors a select a few at the expense of the majority.